In March of 2018, the MWSA Board of Directors approved renaming the MWSA Author of the Year Award to honor long-time member, Mike "Moon" Mullins. 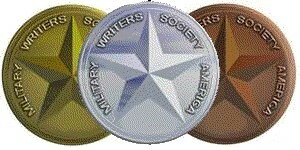 The award is now the Military Writers Society of America (MWSA) Mike Mullins Memorial Writer of the Year (WOY) Award. Special Recognition Awards are an additional and separate part of our review and awards system; and result in reviews and the medal awards mentioned below. Medals are awarded each year based on the combined average, numerical scores of the three reviewers assigned to each book. Because books are scored against our standard—and not against each other—we often award more than one of the same medal in each genre. Medal Award Announcement -- Actual medals won are normally announced during MWSA's annual general membership conference. Presented without cost to all award recipients attending our awards banquet. Award winners who can't attend our banquet need only pay postage costs to have their packages sent to them.